If you haven't already, I recommend trying the new Ergowave version of the SQlab saddle. I really like the previous 611 and 612, but the new 612 Ergowave was good enough to make me bin (well, sell) all my fancy carbon saddles. So let me write a bit about the Maglia-Rosa. 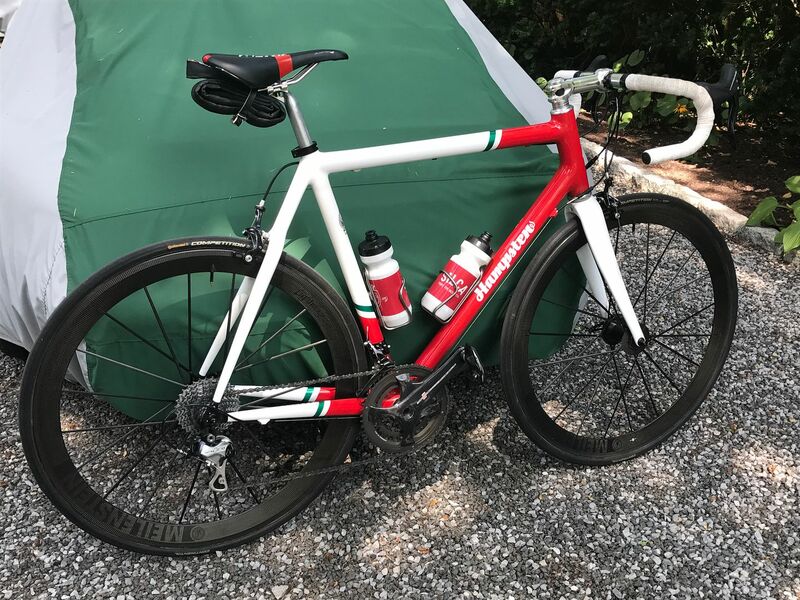 My request to Steve was to replicate the geometry of my recently lost Look 585 and combine that geo with the contact points of the Strada Bianca he designed for me a few years ago. Today was my first chance to see how the bike climbed and descended. Today's ride involved a climb up Tucson's Mt Lemmon. We did the first 14 miles of the climb, just under 4,000 feet of climbing. My Strava feed shows multiple PRs, going up and down. The M-R is smooth, really smooth over crappy pavement. At first I was taken aback by this, thinking that it's ability to smooth crappy pavement meant that it lacked some of the snappiness I remembered from my 585. Now after a few rides, I've come to realize that the M-R accelerates every bit as well as the Look, it just doesn't bounce around at all when I accelerate on rough pavement. Climbing is what I expected, every bit of effort I can muster translates into forward motion. Descending was magnificent. Today's descent starts with 2 miles of twisties and significant elevation loss. Today I found myself entering turns at 40 mph and never feeling even remotely close to the edge of control. Steve and Peter Graham have made an excellent bike that will take me on many great rides. Get one for yourself. She keeps a smile on my face. Note to all posters. Please stop putting up carbon Hampco stuff, particularly in this livery. Otherwise.I.may.just.secumb.... ARRRGHHHH! Gorgeous. Nicely proportioned and Campy. I wish my Hampco looked that good. I'm dying for one of those Spirit HSS jobbers, Hampcoissimo or something like that. 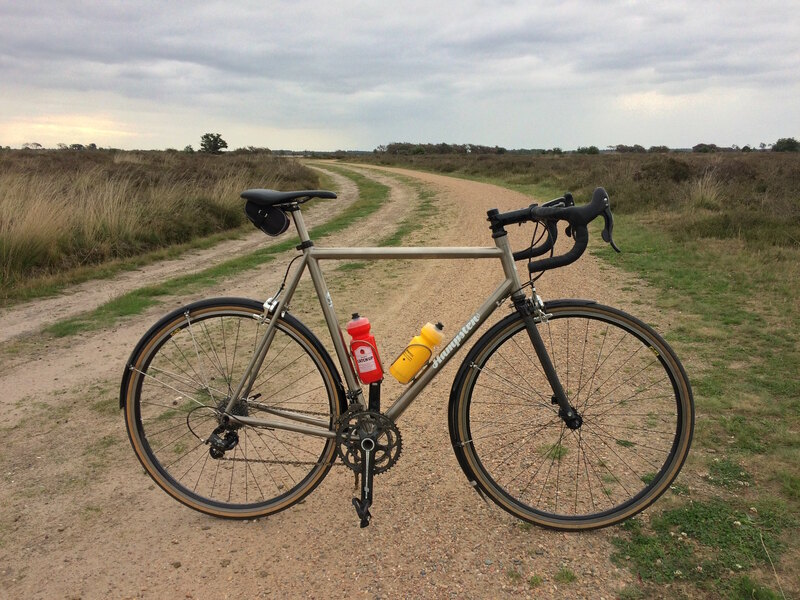 Here is the single speed again, this time with Campagnolo Delta brakes, for summer usage. They're like white shoes - for use between Memorial Day and Labor Day. This bike is definitely getting more hipster appropriate by the day with older, serviceable and somewhat obscure Campagnolo parts. Love the stability and handling of this bike. There's a mile-long gravel segment around this lake and it handles it with aplomb and elegance. 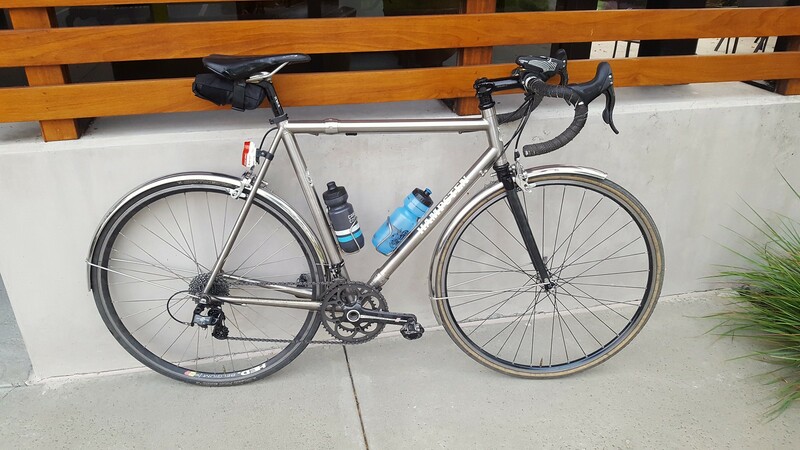 Do you have a side pic of this bike? I'm trying to imagine this in black on my bike to replace the ENVE. I'm a tad confused, Mike - what's the question? I think he needs more steel.....don' t we all. I am thinking about replacing my ENVE fork (clearance issues with 28's). My options seem to be Wound Up that still might have clearance issues, a Whiskey fork that would require a mid reach brake, a Faltz fork or having you make a steel fork for me. I like the looks of the straight blade and think it would look proper on my Pig. Maybe I should talk to you off line. Let's talk off-line, but the Falz and Wound Up won't give you any more room that you already have, the Whiskey is pretty much incompatible with your frame, and the steel fork will solve your issues. Thanks Steve, you just knocked 3 of my 4 options off the board.